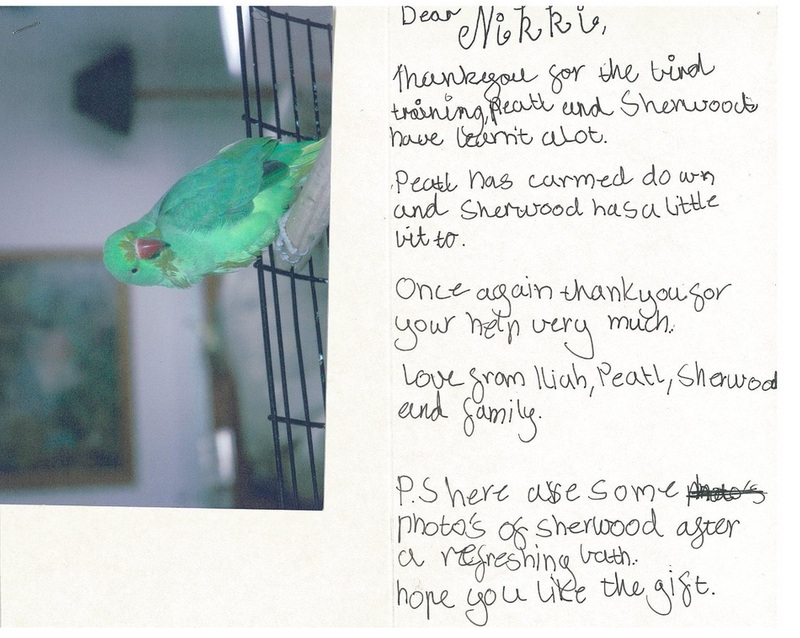 “As intermediate parrot owners, we have had great support and help from everyone at Bird Boarding. Nikki hand raised our beautiful Alexandrine (Bella). From the moment we saw her, we could tell that our parrot and all the birds being raised with her, had fantastic personalities. We felt that this was a strong sign of the commitment and passion shown by Nikki and her staff. Nikki introduced us and Bella to the use of a harness, which we feel allows our parrot some freedom. We were initially very nervous but we were confident in Bird Boarding’s professional advice. In hindsight, it was a great decision and Bella regularly enjoys outside flight using the harness. We would not buy a bird from anywhere else and when we are on holidays, Bella will board with Nikki and her staff. We know that she will be well looked after. “It's been about 4 weeks since we brought Bellee home from Bird Boarding as a companion for Oscar. They moved in to a new, larger home on their first day, each finding their own space. Over the past few weeks we've noticed they are moving closer to one another… Oscar has become a happier bird since Bellee came to share his and our home… He hasn't been anxiously plucking his feathers. Thank you so much Bird Boarding for helping us to make the transition from one seed eating bird, to two healthy birds on a pellet and fresh food diet. "We own several birds. A couple of them have special needs and therefore require specialised care. The folks at Bird Boarding took all this in their stride and made me feel confident that our avian family would receive the very best possible care in our absence. When we returned from our holiday we were delighted with how well the birds had been looked after. This is especially true for our Eclectus who, thanks to the efforts of the Bird Boarding staff, now readily accepts pellets! We'll definitely be using Bird Boarding again - and I am recommending it to everyone I know.